NEW! Now! 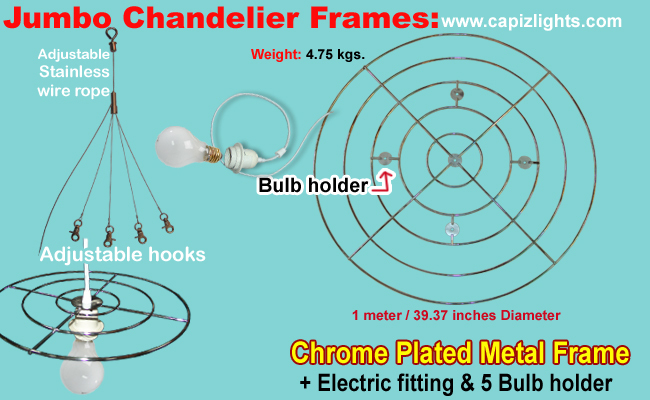 available in 1.5 x 1.5 meter round and square and 2 x 2 meters round, rectangle and square chrome plated metal frames. 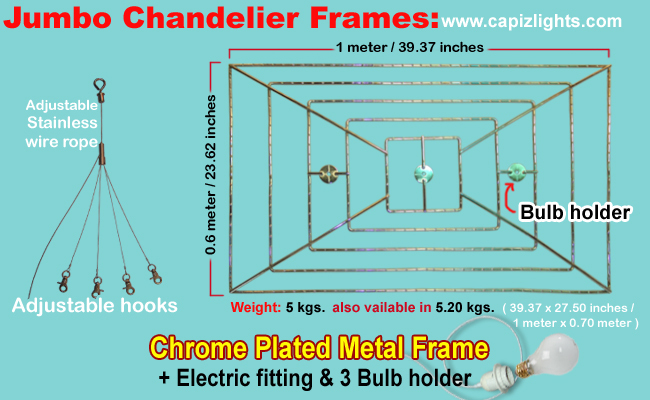 Description:5 layers Rectangular jumbo size capiz hanging chandelier with adjustable stainless wire rope with hooks, electric fitting plus 3 bulb holder. Height:19 inches base to bottom. 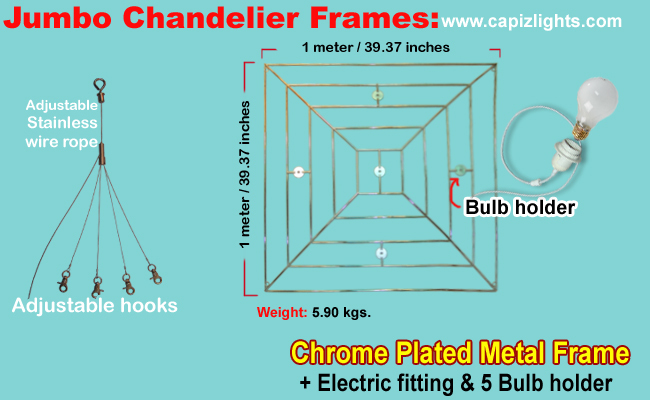 Description:3 layers Square jumbo size capiz hanging chandelier with adjustable stainless wire rope with hooks, electric fitting plus 5 bulb holder. Height:29 inches base to bottom. 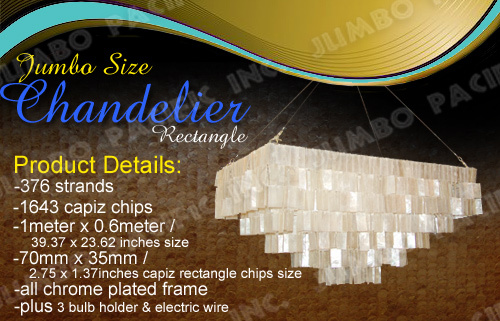 Description:5 layers Round jumbo size capiz hanging chandelier with adjustable stainless wire rope with hooks, electric fitting plus 5 bulb holder. 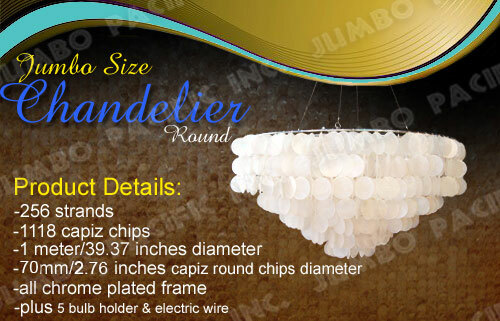 Description:3 layers round jumbo size capiz hanging chandelier with adjustable stainless wire rope with hooks, electric fitting plus 5 bulb holder. Height:36 cm/ 14 inches long base to bottom. 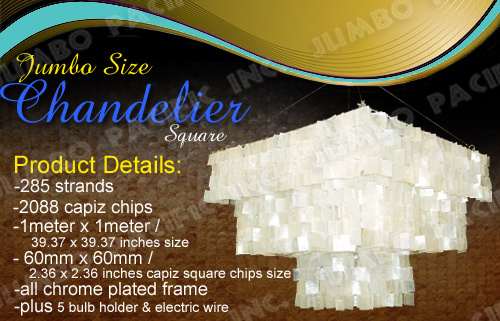 Number of strand/Chips:164 strand, 868 pcs., 50mm / 1.96 inches round capiz chips. 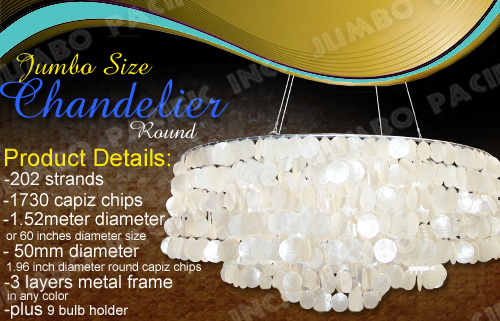 Description:3 layers round jumbo size capiz hanging chandelier with adjustable stainless wire rope with hooks, electric fitting plus 9 bulb holder. Height:50 cm/ 20 inches long base to bottom. Number of strand/Chips:202 strand, 1730 pcs., 50mm / 1.96 inches round capiz chips. 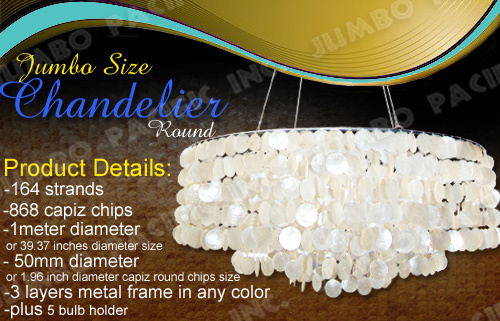 Description:3 layers round jumbo size capiz hanging chandelier with adjustable stainless wire rope with hooks, electric fitting plus 13 bulb holder. Height:80 inches long base to bottom. 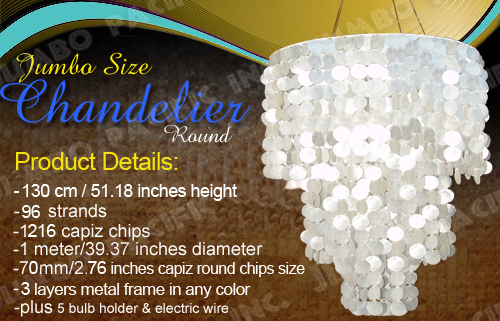 Number of strand/Chips:533 strand, 12,469 pcs., 60mm / 2.36 inches round capiz chips. Height:130 cm / 51.18 inches long base to bottom. 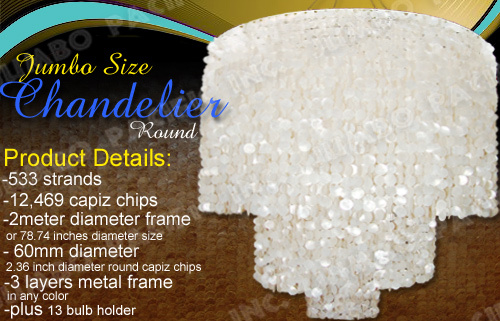 Number of strand/Chips:96 strand, 1,216 pieces., 70 mm / 2.76 inches round capiz chips.